If we want to know what’s coming at us Around Here, we head down to the shore of Grand Traverse Bay and look. Our weather almost always comes at us out of the west, swooping in across Lake Michigan, dancing over the ridge of the Leelanau Peninsula . . . and then it’s here. 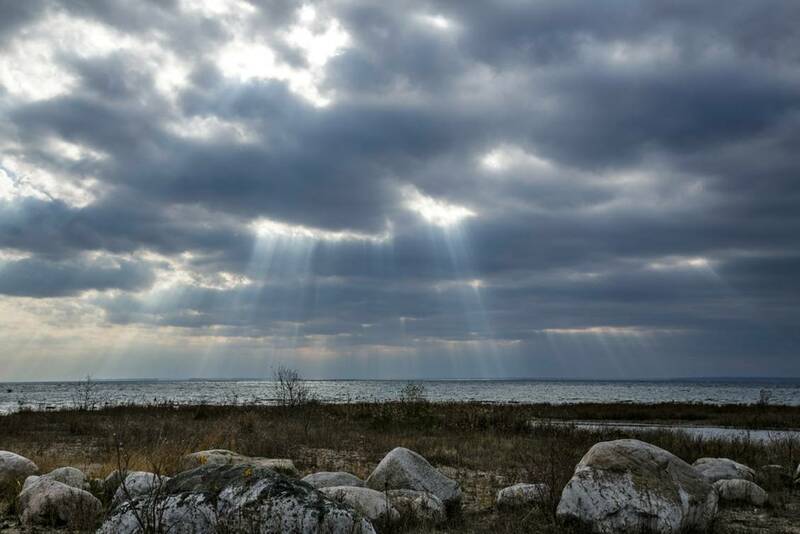 Babs Young went to the end of Rex Beach Road for this report: It was a warm and mostly sunny day up here today, but the clouds began rolling in this afternoon and it’s supposed to get much cooler tomorrow with the possibility of snow. Probably the last warm day for us this year. This morning Miss Sadie and the Cowboy relaxed in their playpen on the deck. I left the door open for the breeze. We are not prepared to believe that there will be no more days like this during 2012. We did, however, order a tank of propane. Optimism is one thing – the wicked weather of the west is another. Here it comes. There are rumors coming out of Montana – and when I looked up late this afternoon, I saw the first winter sky of the year. The clouds looked tropical, but behind them was that steel-gray sky and the sun that only looks “that” way when cold is already happening in the upper atmosphere. Which is to say, we’re in for it, too – although our “it” won’t even get to freezing. Every time I see more of your rocks, I’m happy. They’re the constant in all this. I will go look at some rocks and see if they make me happy too. I don’t know what tomorrow will bring, but at the moment it’s just raining a medium sort of rain. I can deal with that. Yes, we had a window open today as well. The wind is wicked and colder and the rain is letting up. Tomorrow should be absolutely miserable to be outside. Long underwear season has begun. Thank you. I’ve been putting off hauling out the long underwear until I really, really need it – sometime in February, for example. Yep, not too bad here yet either. Yesterday I was out working in the garden in a t-shirt, then I turned the central heating down, then at night I threw off the top blanket. It’s only mid November after all. I wish your east coast could be having a mild spell like this, instead of snow. See, it’s good to have these on-the-ground weather reports. The Big Picture is practically useless. It’s the little pictures that count. Hold a good thought for the storm repair crews working all up and down the east coast. The scope of their task is almost unimaginable. No snow this morning, but plenty o’ wind and chill. I learned a long time ago (but not long enough ago) that wearing long underwear can make the difference between misery and acceptance. The gloom I can do nothing about. The cold I can. Monday, 8:30 a.m. I just went out on the front porch and opened the door. (Sarah and David are still in bed.) The wind is cold and raw, but there’s no snow yet. This is your personal weather report from the western shore of the Leelanau peninsula. You are tough, Gerry. I have had the long woollies on for a fortnight already. Well I put them on today. The North Wind Doth Blow, and we shall have snow – the mean-tempered spitting kind of snow that comes at you horizontally. We should be fine and dandy – between the long underwear and the comforter it is going to be a cozy night. I’m hoping, too, that warmish weather is yet to bid 2012 adieu. My duo and I had a lovely warm walk in the woods this weekend. They are probably wondering why we aren’t walking again right now! The Cowboy would go out in practically anything, but Miss Sadie does not like spitty snow any better than I do. We are looking forward to the first fluffy snow. We grew up on the west shore of an inland lake and watched storms approach all the time. Very very cool thing to see. Not to mention how very, very cool it can feel.